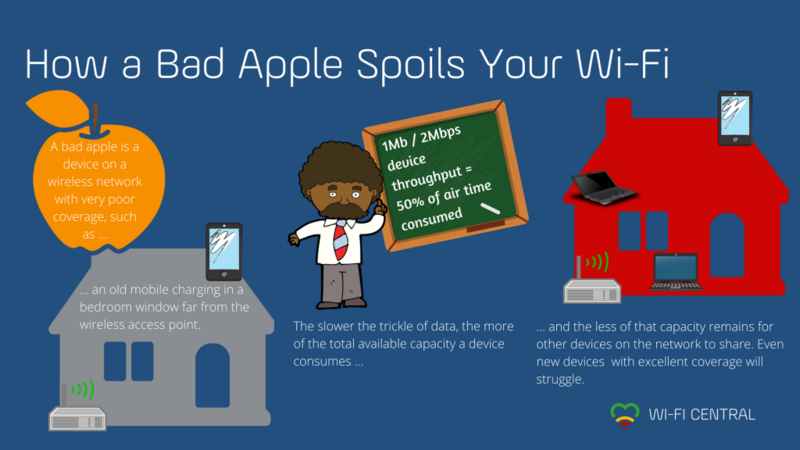 Bad apples are prime examples of how problems that stem from poor wireless coverage can masquerade as speed issues. What Makes a Bad Apple in Wi-Fi? Common culprits are smartphones and tablets that are lying around—perhaps for charging—where the signal strength is poor, while downloading upgrades in the background. These are far from the only reasons bad apple situations happen, however. Most obviously: being too far away from the nearest wireless access point. Old hardware and firmware that don’t support the latest and fastest standards for wireless communication. Any combination of the above points will of course increase the risk. In a home where a router in the living room is the only wireless access point, a smartphone charging in a bedroom window sill downloading the latest app updates can easily become a bad apple. How Can a Single Device Ruin it for Everyone? Airtime is a measure, in percent, of how much time is available in a specific area for any wireless transmission. The poorer the connection for each device (in networking speak that’s a client), the more time the access point (usually a router) will have to spend exchanging data with that particular client. This consumes airtime, which means that the slower one client’s connection, the less capacity remains for everyone else to share. The totality of airtime is always 100%. Some part of the airtime will normally be taken up by interference—wireless “noise” from other networks and wireless equipment. On the 2.4 GHz frequency band, the only band available to older clients, interference can consume as much as 40-50% of the airtime if you are in a densely populated neighborhood. On the newer 5 GHz band, which has a shorter range, there is also far less interference, although this is of course increasing as the 5 GHz band is seeing more usage. The more airtime available, the lower the risk of a new device becoming a bad apple, provided other factors don’t interfere. A client that has good coverage, will transfer data fast and spend little airtime, but if one or more bad apples are consuming a lot of airtime, even a brand new device placed right next to the router may underperform or even fail to connect. Make sure to place your access point for optimal coverage. Generally speaking, any action you take to improve coverage in your home will reduce the risk of bad apple situations. Turn off Wi-Fi on devices that are not in use to avoid them affecting the network. Take particular care to ensure that any wireless repeaters or extenders are within a range of the main router that ensures excellent coverage. Otherwise, the repeater itself may become a bad apple. Devices that connect to this repeater will then further amplify the issue. Our recommendation for a more permanent solution is AirTies Smart Wi-Fi—meshed wireless access points that work together to cover the entire home with Wi-Fi. This solution also isolates potential bad apples and routes every client to the access point and frequency band that provides the best possible performance. The formula for calculating airtime consumed by a client is 1 Mb divided by link speed/transfer speed in Mbps. 1 Mb / 2 Mbps = 50 % airtime consumed by this smartphone alone.